Visit the Bishop's Blog to read this and other recent essays. Don't miss this retreat "created FOR clergy spouses BY clergy spouses" on Saturday, Nov. 5, 9 AM to 3 PM, at Black Rock Retreat Center, Quarryville, Pa. Learn how to celebrate Sabbath according to the Bible, not the calendar, and how to cope with the burdens and boundaries of one's roles and responsibilities. Connect with other clergy spouses to safely share common concerns and solutions. Enjoy and find helpful wisdom in the light-hearted Sabbath Game. Also enjoy inspirational music, lunch and fellowship. Download the Flyer! Register online for $40, by Oct. 29 (no later!). Learn about payment options and if you are eligible for discounts or a partial scholarship. Contact Julie Anderman at artosretreats@gmail.com. 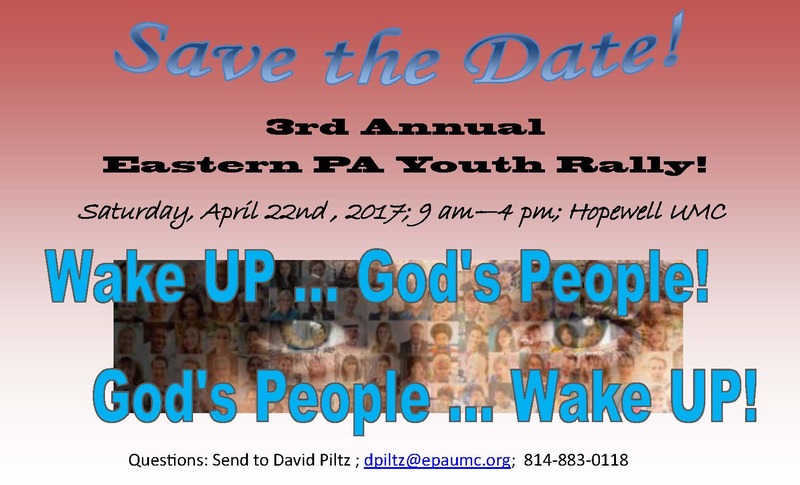 This retreat is sponsored in part by the Eastern PA Conference's Episcopal Office. In the fall issue of NEWSpirit the Rev. Christopher Kurien, Director of Connectional Ministries, invites us to celebrate Native American Heritage Month in November by joining the Committee on Native American Ministries in a special worship service on Sunday, Nov. 6, at 4 PM. The celebration, at Innabah Camp & Retreat Center in Spring City, will also include music, Native American-style social dances, a fellowship meal and a slide presentation by CONAM member Bob Hinderliter from his recent visit with Native communities in Montana. Prior to the service, participants will plant a Tree of Peace, a symbol for peaceful unity among early Iroquois people and the Five Nations Confederacy. "In such troubling, divisive times as these," writes Kurien, "this symbolic tree can be a prayerful plea for peace in our many contemporary struggles." He describes situations that seem to cry out for peace in our church, our nation and our world. But the first planting he calls for are seeds of prayer to seek God's help. The deadline to deliver signed Christmas Cards for Prison Inmates to your District Office or to the Conference Office is coming fast. All cards must be delivered by Monday, Nov. 7, so we can collect, examine, sort and deliver them in time to area correctional institutions. Your individual or church contribution to this conference-wide effort is crucial, so that we can surpass our remarkable 2015 total of nearly 5,000 delivered cards. Read about this ministry. Our partner institutions are participating in this ministry with us again, having seen the way our Christmas cards were so appreciated by their resident inmates last year. Share the love of Christ and the spirit of Christmas with someone who may need a personal greeting of encouragement. Suggested greetings are provided. Please get your cards signed (first names only), collected and delivered to our offices by Nov. 7. Thanks!